Welcome to the October digital release blog hop!!!!!! 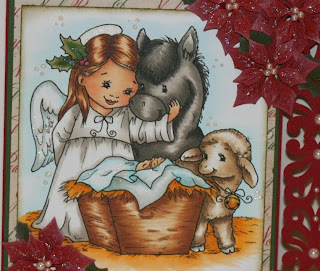 All Whimsy Stamps digital images are 300 dpi for high print quality. You can re-size, flip, or rotate to fit your own project. To find all of today's new releases please visit the Whimsy Stamps Store. Don't forget to leave comments along the way as there will be 2 mystery DT Members who will be choosing a winner from the comments left on their hop posts! This winner will receive 5 digital stamps of their choice from the Whimsy Stamps Store. The hop will run for 1 week and end on Tuesday October 8 at 12 Noon EST, when the lucky winners will be announced right here. 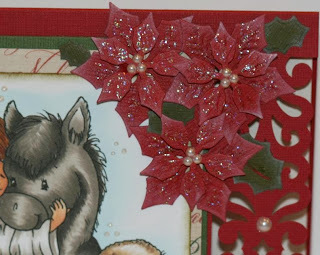 This is the card I made for the blog hop using a Crissy's digi called Infant King. This image is absolutely adorable and so much fun to color and create with. A very festive card for the right around the corner Christmas season. A closer look at the colored image, showing all the details in the stamp. WOW!! This is gorgeous. The image is adorable and your colouring is so beautiful. I love the poinsettias too. Charlene - I am loving this digital stamp - for your creation I love the border cut with the pearls and of course the poinsettia flowers as well - a lovely card - thank you for the hop - for showing your work and for the opportunity to win a prize as well - enjoy your week! Awwww!! Such an adorable image...and you colored & showcased it beautfully!! Amazing card! 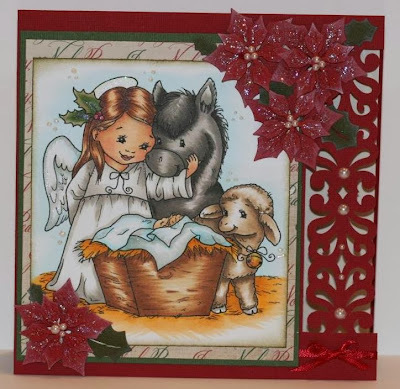 Fantastic coloring job and I just adore the layout of the card with the poinsettias. Beautiful card! Fabulous coloring and love the embellishments. Perfect holiday card. Wow! I love your coloring! It's fantastic! Lovely card. This image is so cute and you have coloured it wonderfully.